cifaljeju > Sus. 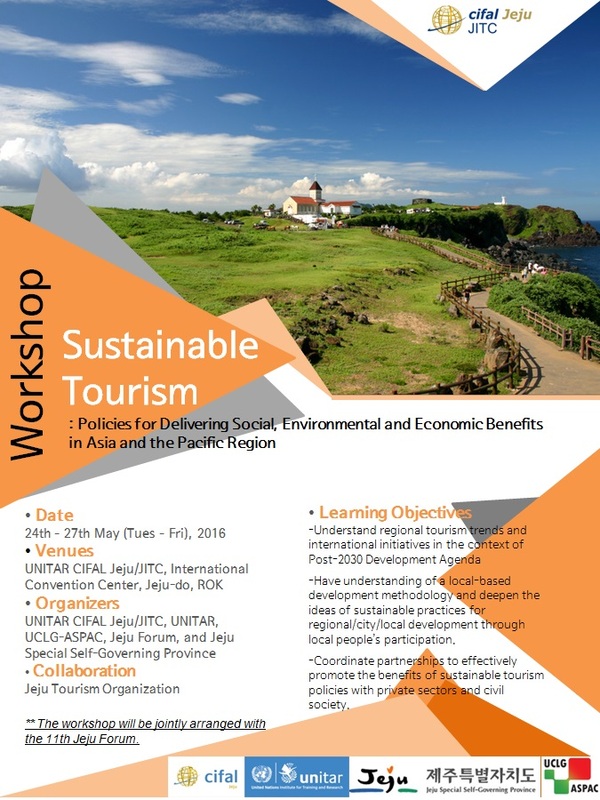 Tourism (Past workshop info) > 2016 May 24-27 : "Sustainable Tourism: Policies for Delivering Social, Environmental and Economic Benefits in the Asia-Pacific Region"
Tourism has shown a dynamic growth every year. With its popularity and importance, many projects have been implemented around the world, attracting people's attention to sustainability in tourism policies. The dominant agenda on tourism development has moved its focus from 'how much developed' to 'how well developed', which called for concerted participation from both individuals and public and private sectors. CIFAL Jeju/JITC enables local governments and stakeholders to have a solid grasp of sustainable tourism by giving them opportunities to explore various elements of sustainable tourism such as environmental protection, economic growth and social inclusion. In particular, Cifal Jeju has expanded the scope of the workshop to include culture and art in the context of sustainable development. "Sustainable Tourism: Policies for Delivering Social, Environmental and Economic Benefits in the Asia-Pacific Region"
Taleb Rifai, the UNWTO Secretary-General has clarified that “tourism is a surprisingly strong and resilient economic activity as well as a fundamental contributor to the economic activity” in his opening speech at Spain Global Tourism Forum . Certainly, tourism has shown a dynamic increase in the international tourist arrivals recording 1,130 million in 2014, occupying 9% of global GDP, and creating one in every 11 jobs worldwide . Particularly, Asia and the Pacific region showed the strongest growth in tourism population, welcoming 263million international tourists in 2014. By sub-region, the North-East and South Asia recorded a firm growth by 7% average. Further, some of the major popular destinations achieved even higher increases suggested as follows; Japan (+29%), Taiwan (pr. Of China)(+24%), and Republic of Korea in North-East Asia and India (+11%), and Sri Lanka (+20%) in South Asia . As the tourism has gained more popularity and importance, with many projects being implemented around the world, it attracted people’s attention to the questions of how to develop tourism policies. That is, people have witnessed reckless development is manifested in some negative consequences and problems. Ecological degradation and loss of cultural heritage are one side of the adverse effects. Not only the environmental changes but the issues of social engagement, and respect amongst diverse groups of people are the challenges that we face with. For a long-term outlook, people have an untold consent that these could be the latent risk factors that threaten even the merit of the current tourism development, economically. In this sense, tourism has become internationally and officially recognized within the UN dialogue like the UN Commission on sustainable Development (1999) for the question of ‘quality tourism’ rather than its ‘quantifiable volume’. The dominant agenda on tourism development has moved its focus from ‘how much developed’ to ‘how well developed’, which called for the need of sustainable development. Finally, sustainable tourism has been clearly adopted in the final draft of the Post-2015 Development Agenda which pursues a will of sustainable development in tourism. In this regards, the workshop will raise awareness on UN initiatives for sustainable tourism. It also includes a solid grasp of its principles, strategies, challenges & opportunities and financial cooperation by looking at some case studies such as a community-based policy development method. Through the live voices of international/ national/ local experts, the participants will have a chance to develop the relevant policies to promote their natural and cultural heritage site for social, environmental and economic benefits.
? - Provide an opportunity for local governments and cities in the Asia-Pacific region to transfer knowledge and promote discussion.
? - Offer a venue to exchange their best practices throughout city-to-city cooperation.
? - Promote a learning atmosphere between cities and establish a strong network that they can utilize after the workshop.
? - Inspire motivation to participants for implementing sustainable tourism policies in practice.
? - Utilize the lessons learned from the cases of tourism policy implementation in the Asia-Pacific region and internationally for their action plans.
? - Prioritize actions, targets, indicators and measures of progress to optimize the positive impacts of the regional tourism policy.
? - Describe methodology and a checklist needed for policy development considering both challenges and advantages of their region.
? - Have understanding of a local-based development methodology and deepen the ideas of sustainable practices for regional/city/local development through local people’s participation.
? - Coordinate partnerships to effectively promote the benefits of sustainable tourism policies with private sectors and civil society.
? - Summit necessary documents on time, i.e., application forms etc.
? - Complete and submit pre-training assignment, i.e., case study description etc. - Late application will not be accepted. - UNITAR CIFAL Jeju/JITC provides a LIMITED financial assistance with the airfare to Jeju-do, ROK. - Expenses in Korea (transportation, accommodation and meals during the workshop) will be covered by CIFAL Jeju/JITC. - All other expenses are the responsibility of the participants. * Other points of departure ? please contact UNITAR CIFAL Jeju/JITC. * the table represents the maximum amount of financial assistant for a round-trip international air travel.